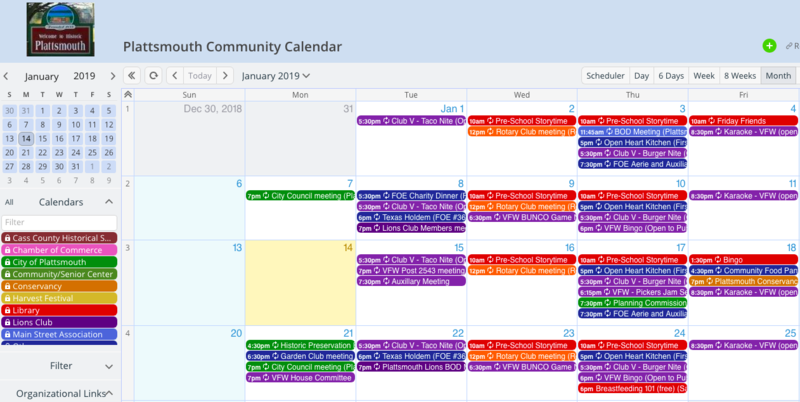 The Plattsmouth Public Library has set up a shared community calendar that multiple organizations and groups use to keep community members informed about events, area opportunities, and updates. 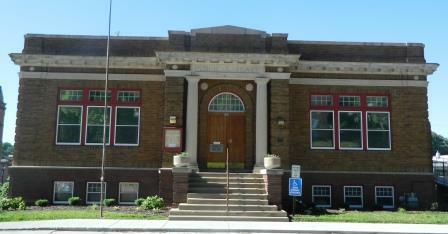 Plattsmouth Public Library, in Plattsmouth, Nebraska, US, serves the educational, informational, and entertainment needs of the community by providing a balanced and friendly environment with open access to resources. They offer a wide variety of classes and resources, including a laser cutter, computers and computer classes, digitized local newspapers, playgroups, story time, and more. Karen Mier is the Library Director. She let us know how the library staff has incorporated a Teamup Calendar to further serve their community. The library would often get calls from people asking where or when a community event was to take place, and many individuals and groups asked for this kind of calendar for many years. It was thought to be too time consuming, with too much burden on the library to keep track of all the events (city population, 6500). The responsibility of keeping a calendar current is shared among the members, and the community has one place to look for activities around town. A Teamup Calendar on the Plus plan allowed the library to set up a community calendar that was a group effort. With most of the events administered by the major community organizations, the library was responsible only for adding events for the small groups. Sharing the responsibility of keeping the calendar current is key to its success. The groups that participate and others in the community are encouraged to place links to the public calendar on their websites and to promote it to their members. Likewise, links to the participating groups are available on the calendar. Participants include the City of Plattsmouth, the Chamber of Commerce, the County Historical Society, the Rotary, the Garden Club, the VFW, and churches. The library pays the minimal cost, and everyone wins! The calendar is linked from many pages, including the city, the library, and the museum. The responsibility of keeping a calendar current is shared among the members, and the community has one place to look for activities around town. Public Read-only permission: The ability to share the entire calendar with a read-only permission makes it easy and safe for the entire community to access the shared calendar from several websites and organizations. It’s easy for everyone to find the information they need, but only authorized individuals can make changes to the calendar. Custom calendar links: Each organization or group can have their own, separate sub-calendar. The calendar administrator can give each group a unique calendar link with Modify permission for their own sub-calendar, and Read-only permission for other calendars. This way, everyone can add the information for their own events with no risk of accidental deletion of other events or information. About box with pertinent information: The About box on the left sidebar of the calendar is editable, so it can include whatever information is most helpful for calendar users. Karen has added links to all the involved organizations and groups in the About box, so community members can easily find more details about events as needed. An edited About box with important links. Many thanks to Karen Mier for sharing this story with us!